We are working on providing Business Analytics using Data Visualization and Business Intelligence solutions to the local businesses and retailers. 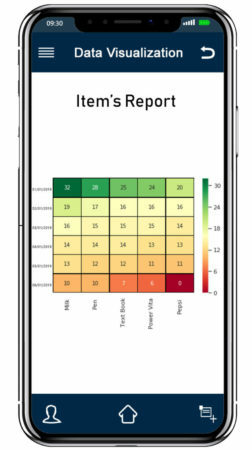 Our product : the app, would also include a recommendation system based on Machine Learning for retailers so that they can have better insights and suggestions for improvement and would help them to scale-up their business. We are using Bar-graph to show daily and weekly insights of sales or profit in a visual form of data by placing it in a visual context to communicate information clearly and efficiently. 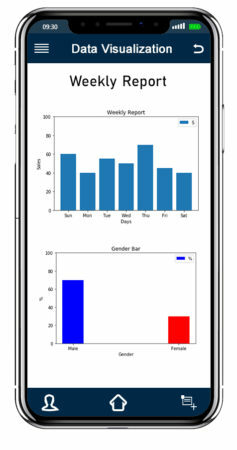 Data visualization uses statistical graphics as shown in this prototype. 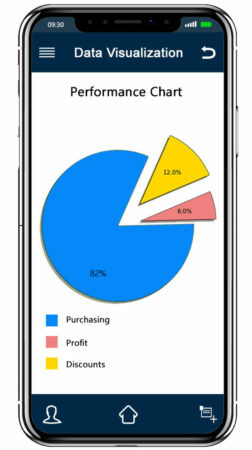 We are using Pie charts to show monthly purchasing, profits and discounts to the retailer or business owner. It is divided into slices to illustrate numerical proportion and percentages. We are using Pie charts to show monthly purchasing, profits and discounts to the retailer or business owner. It is divided into slices to illustrate numerical proportion and percentages. We are using Heat Map as a graphical representation of data where the individual values contained in a matrix are represented by colors that depicts the quantity of items that are being sold in high, less or moderate quantity. We are using Half Circular Gauge meter which represents the number of customers for a business or retailer in a month and the meter can also be used to represent overall performance of the business for a better understanding. We are using a graph to track and to represent daily sales or profit in real time which gives a better view of understanding and helps in appropriate decision making.